I'm loving that I'm a jet setter this month. Yep, I'm off to Myrtle Beach, NYC, Chicago and Seattle... for work. I'm loving that we're having warm nights this week! I'm loving White Zinfandel. I never in my life thought those words would ever come from me, but it's true. A good white zin is so refreshing on a warm spring evening! I'm loving all of the new clothes we bought Bryan this past weekend... Can you say "hottie?!" He hates to shop. Despises it, but I'm a firm believer in that we not only need to look good for ourselves, but for each other, so he sucked it up for me and looks so amazing in everything!Speaking of my hubby, I'm loving how tan and gorgeous he is... yum! And how cute is my baby sleeping on him? I'm loving what I wore on Easter. From shoes to dress to necklace to earrings, oh how I loved my entire outfit!! I'm loving that the football lockout is over. I know that the owners are appealing, but at this point the lockout is done and done! I'm loving how all of the sudden my blog is growing so quickly -- thank you to all of my new followers! I love blogging and I love reading all of your blogs. I find it all so inspiring and rewarding! What are you loving this week? Visit Jamie's blog and tell us! Love that picture of your precious dog! Such great things to love! Wow you are jet-setting! 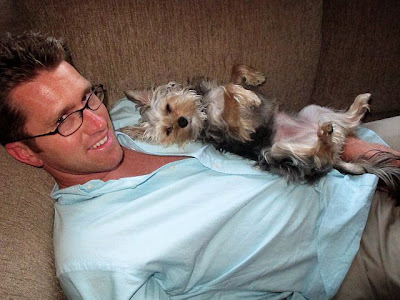 Love that picture of your hubby and dog, adorable! I love that you like white zin! it really is delicious.. I mean all that sugar with my alcohol! clearly I'm in love. just found your blog through Shasta Ann...love it! you are too cute! Have fun on your travels! 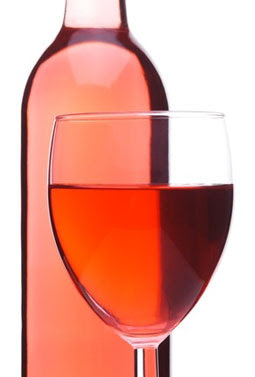 I love white zinfandel too! And that picture of your hubby and doggie, is too cute! I just LOVED your Easter outfit too! 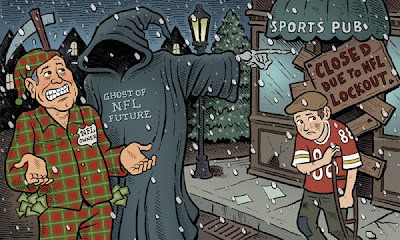 I'd probably cry if there was no NFL season. What a good hubs you have! I can't agree with you on the wine (I try to like wine it just hasn't grown on me though) annnddd a tad jealous of your jaunting about the country! I hope you enjoy Myrtle Beach! The weather has been great here! Let me know if you need any recommendations on where or what to do.